I stumbled across the following essay series a few months ago, but forgot to share it with you. 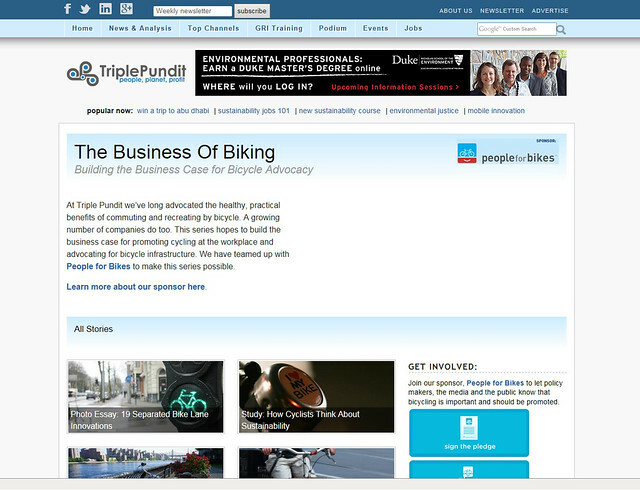 It’s from the website Triple Pundit, and is a collection of articles sponsored by People for Bikes. Click here to visit the Triple Pundit page. If you own a business and want to encourage your employees to use a bicycle to get to and from work, there’s an excellent article right here to help. Even if you’re not in a position to call the shots at your company, some of the tips and tools in that article may come in handy…even if only to encourage your coworkers to join you on two wheels. And, if you can bend the ear of a sympathetic owner/manager, who knows…you might just be the person who gets to implement a bike-commuting incentive program for your company! The Fifth Annual Bicycle Bash is all about celebrating bicycling in the Tampa Bay area and it’s brought to you by SWFBUD (South West Florida Bicycle United Dealers) — a nationally-recognized alliance of 12 Tampa Bay-area bike stores and three lawyers, too. The 12 SWFBUD bike shops are Carrollwood Bicycle Emporium, Oliver’s Cycle Sports in New Tampa, Just Ride Bicycles in Lithia, Bicycle Outfitters in Seminole, Chainwheel Drive in Clearwater and Palm Harbor, University Bicycle Center in north Tampa, the Trek Bicycle Store in South Tampa and Clearwater, ABC Bicycles in St. Petersburg, Street Fit 360 in South Tampa, the Trek Bicycle Store of St. Petersburg, the Ironman Store in New Tampa and Velo Champ in Seminole Heights. SWFBUD members who are lawyers are Thomas Singletary in Tampa, J. Steele Olmstead in Tampa and the Mark Roman Law Group in Clearwater. The Bicycle Bash invites bicyclists of all stripes, backgrounds, ages and interests to come to beautiful Flatwoods to visit the bike shops, check out the vendors, bike the seven-mile paved loop or a mountain bike trail, enjoy the music, food and swap meet. SWFBUD thanks our presenting sponsor — the Cure on Wheels bike ride, which will hold its event one day before the Bicycle Bash on Saturday Nov. 5 at Flatwoods. We also thank our co-sponsor, Hillsborough County, which manages Flatwoods Park, and our sponsor, American Traffic Solutions. See you Nov. 6 at the Bike Bash! There’s going to be a lot of good times for bicyclists…Tampa’s Mayor Bob Buckhorn will be there to lend his support for the Peopleforbikes.org petition; food from the fabled “Taco Bus” (featured on Man Vs. Food and on Diners, Drive-Ins and Dives, both on the Food Network) will be served; rides to, from and around will take place during the event…so much to do and see! The Bash goes from 10AM to 4PM on Sunday. And, for the first time since the Bash’s inception, I won’t be there to capture words and images of the event. However, if you’re interested, you can see coverage of past years’ Bashes by clicking here. If you’re in the area, it’s a must-visit event — one of, if not THE largest bike festivals in Florida.